Bottom Line: Initially it appears to be a very capable power supply..... but when you entice the buying public with bling and gizmos, slap a 400W label on it, and then bundle a 20-to-24-pin adapter, you invite disaster. I was presented with another Thermaltake to review. My only standard for these tests is that the power supply be 450 to 600W. Unfortunately, not all 480W's are created equal. Case and point: The 450 LION I just reviewed. It's "only" a 450W, but it did 30A on a 12V rail only rated for 28A. That's pretty good. 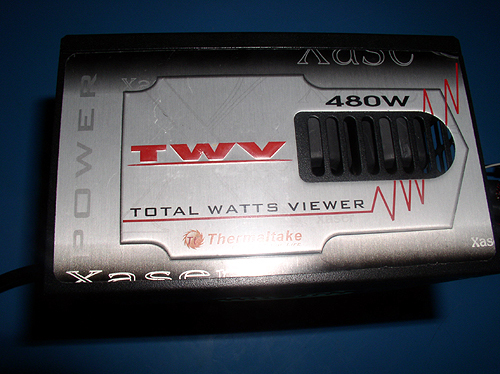 The Thermaltake we're reviewing today, the TWV480 with active PFC, only has 18A available on the 12V rail. That's only 1A more than the Butterfly power supply I had reviewed earlier, which now seems to have been an "older model" since Thermaltake's website now states that the Butterfly has 18A on the 12V rail as well. I have to wonder why they bothered at all. All of the rails have different specs, but if they had to migrate over to a different platform, why not either completley redesign the power supply or discontinue it? Truth be told, I could get any number of mere 400W power supplies if I wanted something with less than 20A on the 12V rail. This one is 480W. That's what's irritating to me. Not that this power supply can't do 480W; but that to get to that wattage, one would have to have almost all of their load on the 5V rail. So this would be a good power supply for someone with a Socket A board, perhaps a micro ATX Socket A board, or a Pentium III. The side of the power supply looks cool in it's own "Warning Will Robinson!" kind of way.